The Seguro valve was introduced to the market in 1972 and represents a well proven concept in gate valve design. It is unique in that the sealing of the gate valve is effected by a soft rubber seal; firmly secured by a special wedge. The Seguro is today manufactured in sizes up to 64″ or 1600 mm. The wedge is guided by grooves, cast into the valve body. Because Seguro has no seat rings in the body, a smooth full bore is achieved. 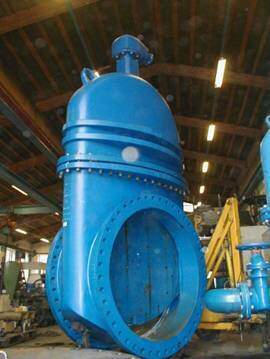 This, plus the self flushing design of the valve body, eliminates possible build-up of sediments or other foreign matter in the valve body. The result is a minimum of maintenance and 100% tight closure. The packing gland has been replaced by with(delete) a double o-ring seal embedded in nylon. Valves with rising stem uses U-packings in the brass bushing. (delete) This design assures positive sealing at the stem and minimizes maintenance. The above features, combined with the simple sound engineering practices, assure an ideal shut-off for almost all installations and media.